Half the swimming, twice as thrilling! 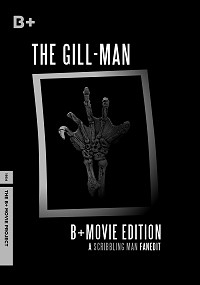 "The Gill-man" is the first entry in the "B+ Movie Project", a series of edits that seek to improve on older films, but still maintain the charm and narrative of the original cut. When I watched "Creature from the Black Lagoon", I found a film that had its moments, but was generally pretty boring. The so-bad-it's-good experience was seriously "watered-down" by a crazy amount of filler - so I sought to remove that, along with the man-in-a-rubber-suit vibe. If you found CFTBL boring, you should find this engaging. If you liked CFTBL, you may find yourself liking "Gill-man" even more. It was intentional that nothing immediately obvious should be removed, but that the film would simply come across as better paced and more entertaining as a result of the numerous tiny trims. My chief aim with this edit was to cut down the filler and in the process create what is hopefully a shorter, better paced and more enjoyable experience. I didn't want to remove any scenes or dialogue, if possible – the result was that no scenes were cut, but a small handful of negligible dialogue was removed. My approach was to do numerous small trims throughout the film in the hope that the viewer would not necessarily be able to tell if anything was cut, but simply find themselves being much more engaged and entertained compared to when they viewed the original. No scene was left untouched. At the moment only an MP4 is available, but I am planning on bringing out a DVD, along with special features. - Sinbad – for consistently generous feedback and encouragement, as well as technical assistance. - Theryaney – for providing a 4:3 B&W version of his Netflix-style fanedit.org logo. - jswert123456, for providing an alternative DVD cover spread. - All who showed interest in the edit. - All who contributed to brainstorming the title. - TM2YC, for his swift viewing and approval, favourable review and technical assistance. - My sisters for helping with my branding. I can be a forgetful soul, so if I've missed anyone out please accept my apologies and thanks! Edited using Sony Vegas 12 and a single VOB file. The soundtrack was often cut and cross faded, and on rare occasions, slightly sped up or slowed down so as to better match the pacing of the video. There were also occasions where, in order to make a cut work, I re-synced different dialogue with the actors lips. Some video was also sped up in order to make the Gill man look less sluggish, improve characters reaction times and move along slow panning shots. The new "Gill-man" title was created by using a similar font and resizing certain letters to match the style of the original titles. The smoky backdrop used was footage from the public domain which I then put through a film damage filter and adjusted until it matched the rest of the credits. I also adjusted the opacity of the letters so as to better blend them with the backdrop. - Trimmed or removed various panning scenery shots throughout the film. - Sped up underwater shots of creature to make him appear more agile than humans underwater. - Slightly sped up selected shots of Creature on land in order to make him seem less sluggish and man-in-a-suit like. - Trimmed gaps in between certain lines of dialogue to make it seem more natural. - Swapped out/altered shots and audio (dialogue and music) in various scenes, either due to preference or convenience. - Generally went for a less is more approach. The less we see the creature, the less we realise it’s a man in a suit. - Overall, nearly no scene was left untouched – however, no scenes were cut and maybe two lines of dialogue were removed. The main aim being to keep the entire narrative of the film exactly the same, but make it better - more enjoyable; better paced, snappier, more intense. - Added theryaney’s fanedit.org logo. - Excavator doesn’t say he will take another photo and then dig – just takes a photo and digs. - When we see the creature place its hand upon the shore, we fade out before it slips back into the water. - Cut opening shot of Marine Institute. -Trimmed lengthy scene of diver resurfacing. - Trimmed fish tank panning shot. - Trimmed opening shots of boat. - Cut fade transition when Lucas frightens the alligators. Instead, we cut straight to David and Kay talking. - Cut shot of them calling from the rowboat. - Trimmed scene with creature reaching for Kay outside the camp. - Trimmed shot of creature splashing away. - Cut David telling Kay to get back on board. - Trimmed shots of boat. - Trimmed Mark arriving on deck. - Trimmed arrival at Black Lagoon. - Heavily trimmed diving sequence. - Cut shot of creature grabbing for divers leg. - Cut out about 1.5 minutes from the swimming/stalker scene, including the creature just floating around lamely and trying to touch the woman. - Added shot of creature grabbing for woman's leg just before she gets on boat. - Heavily trimmed creature caught in net. - Heavily trimmed second dive. - Trimmed creature’s attack on the boat and improved David’s response time. - Water drugging scene is very heavily trimmed. I mean, man, this scene is long! - Sped up panning shot of people guarding the boat. - Instead of panning all the way, we cut to David early. - Trimmed creature’s attempt to get on the boat. - Trimmed finding the creature with searchlight. - Trimmed creature’s response to the light. - Improved David’s reaction time in going after the creature. - Trimmed David and Mark swimming to where the creature was. - Trimmed David diving after mark. - Trimmed David and Marks exploration of the lagoon. - Shots between Kay and creature are quicker, and Kay's reaction time is improved. - Improved reaction time of henchmen after Kay screams. I did this by speeding up the clip of him bracing himself. - Extended pause before Kay says “… But he didn’t” and added shot of creature to create a greater sense of empathy. - Cut several shots of the creature during when the doctor guards the trapped creature. - Also, cut dialogue from this scene, partly because it was pretentious (“some are afraid, like humans whistling in the dark” – really?) and partly to eliminate more shots of the creature. - Sped up creature smashing lantern. - Trimmed winch scene (my gosh, this drags…). - Trimmed David diving to fix winch. - Trimmed David and Mark fighting with the creature. This is now less than half its original length. - Quickened Kay’s reaction to Mark’s body. - Trimmed David retrieving Mark’s body. - Trimmed drug mixing scene. - Trimmed scene with David drugging the creature underwater. - Heavily trimmed second winch scene. - Trimmed creature climbing aboard. - Improved Kay’s scream reaction and sped up creature diving with her. - Trimmed creature and Kay arriving in Lagoon. - Trimmed David looking for creature in Lagoon. - Trimmed David fighting creature. - Trimmed creature getting shot to make it more relentless and less sluggish. - Trimmed people following creature. What can I say really, this edit just makes the film feel a lot more compact and entertaining for me. Effective trim of an already shortish horror film. The editor's aim was to carve out the slack bits, and thereby boost the pacing. Nicely done. Video - 1280 X 720p. Black n white, with good contrast. The underwater photography in this is outstanding, and the final interior cave shots are fine. Cuts went by unnoticed. Audio - 224 Kbps 2-Channel, AAC. No subs. Dialogue is clear and understandable throughout. One might argue the finest element of this film is the soundtrack, which is dramatic and effective. Narrative - Tell the truth, I did not notice any change in the narrative. And yes, quit a bit was excised. The story flows fine, I did not notice missing passages. This is a light edit and, because of the brevity, easy to digest. Boy meets girl - boy chases girl - conflict. Enjoyment - Of all the "classic" Universal monsters, the Creature has always been one of my least favorites. Possibly because there is next to no history or backstory for the guy. He's existed for thousands of years in his isolated bachelor pad? Is the Creature even a he? If the Creature is actually a "she" then the sequence where it kidnaps Kay has a whole new dimension! Otherwise, the Creature comes across as this lovesick sap. Where were the village maidens? Countless manfish mutant fishpop offspring? Yeah, kicking a rock, sorry. Nevertheless, compared with the original feature, Scribbling Man's edit is much preferred. Enjoy with your favorite fish sticks! not too much to say here, overall pretty good. slimmed version is worth watching.